THE addition of former Cork goalkeeper Donal Óg Cusack to the senior hurling management team for 2016 is one of the reasons for the increased interest in this season’s Munster Hurling League, which gets underway this weekend. The fact that Clare’s opening game will be against Cusack’s native county is further adding to the interest to the game, which is scheduled for O’Garney Park, Sixmilebridge at 2pm on Sunday. Cork are under new management, with Kieran Kingston at the helm backed up by Diarmuid O’Sullivan, a Cloyne clubmate of Cusack, Pat Hartnett and Pat Ryan, All-Ireland medal winners with Leeside teams. Sunday’s game is the first of four games Clare will play in the coming weeks. A disappointing 2015 when relegation to Division 1B of the league was followed by an early exit from both the Munster and All-Ireland championships, led to criticism of the Clare management team, led by Davy Fitzgerald. The Sixmilebridge man’s decision to add Cusack to his backroom team has been broadly welcomed and hopes of climbing back up the ladder in hurling’s order of merit have been building. 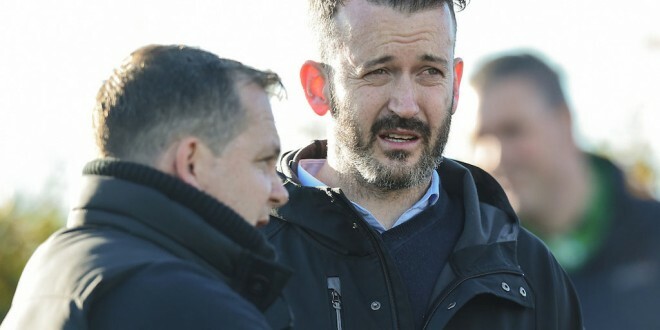 Fitzgerald has also added Broadford’s Aonghus O’Brien and Waterford man Jimmy Payne to his team, in which selectors Louis Mulqueen and Michael Browne will continue. The team for Sunday’s game won’t be finalised until later in the week but it is likely to include a mixture of new players and some regulars. “We purposely didn’t return to training until December 20 and the lads are training really hard at the moment. By the time Sunday’s game takes place, we will have played three or four games. 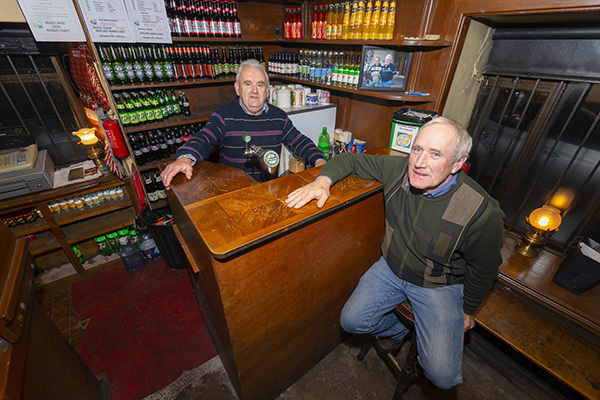 We played LIT, the Clare U-21s and NUIG in the past week and lads will be tired. We have a bit of ground to make up because of the late start,” Davy Fitzgerald told The Clare Champion earlier this week. Management will have to plan without a number of regular squad members due to injury. Seadna Morey, Conor Cleary, Cathal Malone, Brendan Bugler and Podge Collins are all still out of action, while team captain Cian Dillon and fellow defender Davy McInerney are unavailable this week. 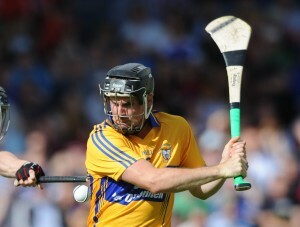 Brendan Bugler in action in a league game against Tipperary. Photograph by John Kelly. Cathal Malone suffered an ankle injury when playing with Sixmilebridge against Na Piarsaigh in the club championship and is not expected back for another few weeks. Collins wont see competitive action before the middle of March at the earliest, while Cleary and Bugler are still a few weeks from a return. Morey, as reported last week, won’t be back in competitive action before the end of March. Cork are also expected to use the upcoming tournament to experiment ahead of the national league, which begins in mid-February, when Clare will open their challenge to return to the top division with a home tie against Offaly. Clare will have a bye in Round 2 of the Munster league (January 10) before they play Kerry on Wednesday, January 13 (Clare venue). They will travel to play Waterford on January 17 and Limerick on January 24. A game against Munster club champions is also planned for the weekend of January 16/17. 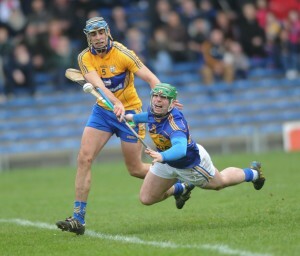 Meanwhile, in preparation, Clare took on a somewhat understrength NUI Galway selection, at Limerick IT on Wednesday. Among those missing were the Mannion brothers, Cathal and Padraic, Conor Whelan and John Hanbury, who are with their county team-mates on holiday. Bobby Duggan (Clarecastle) and Oisin Donnellan (Feakle) were also absent from the students’ line-up, which included Darragh Fitzgerald (Sixmilebridge) at full-back, Stephen Ward (Clarecastle) at wing-back and Ryan Taylor (Clooney-Quin) at full-forward. Colin Ryan, a vital cog in the Clare team. Photograph by John Kelly. Clare held a half-time lead of 2-16 to 1-6. Clare: Pat Kelly (Inagh-Kilnamona); Eoin O’Brien (Newmarket), Jack Browne (Ballyea), Pat O’Connor (Tubber); Gearóid O’Connell (Ballyea), Conor Ryan (Cratloe), Eoin Quirke (Whitegate); Colin Ryan (Newmarket), Shane Golden (Sixmilebridge); John Conlon (Clonlara), Michael O’Malley (Kilmaley), Peter Duggan (Clooney-Quin); David Fitzgerald (Inagh-Kilnamona), Darach Honan (Clonlara), Cathal O’Connell (Clonlara). Among the substitutes introduced were Shane O’Donnell (Éire Óg), Tony Kelly (Ballyea) and Conor O’Donnell (Crusheen).